A few months ago, the Land Transportation Office (LTO) launched an online appointment system to help drivers apply for licenses and renew their vehicle registrations through the Internet. Now, the LTO unveiled an online platform that allows you to check if your vehicle registration plate is already available and ready for pickup. 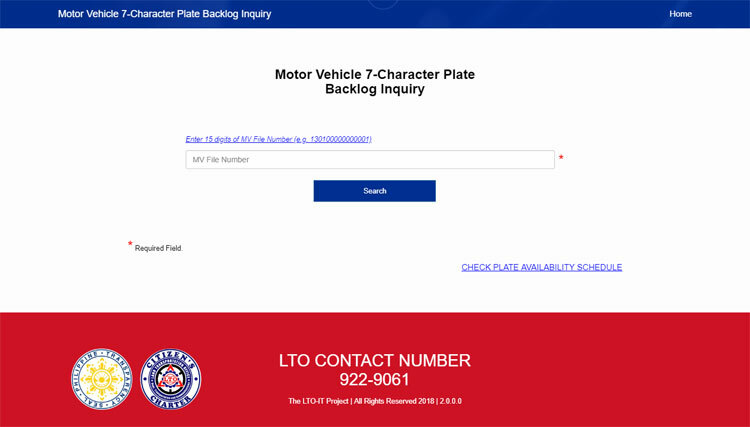 Called the Motor Vehicle 7-Character Plate Backlog Inquiry, the web-based system makes it easy and convenient to check if your LTO license plate is ready. Simply enter your 15-digit motor vehicle (MV) number which is located at the top-left portion of your certification of registration. If your new license plate is available, the website will tell you when and where you can claim it. You can check the availability of your MV license plate at the LTO website here. The LTO said that some of the available plates are for those who bought their vehicles dating back to July 2016. The agency added that owners of motor vehicles registered before July 1, 2016 will not be able to claim their seven-digit license plates yet. Those license plates are under a different supplier and have encountered problems with the Commission on Audit. Last July 5, 2018, the LTO started releasing the license plates of motor vehicles registered in July 2016. The LTO also said that they have produced more than 230,000 pairs of license plates. LTO Assistant Secretary Edgar Galvante revealed that they have a backlog of 775,000 pairs of new vehicle plates. This does not include the 1.7 million pairs of plates needed for motorcycles. LTO license plates are being manufactured at the LTO Compound in East Avenue, Quezon City. The facility currently has a daily maximum output of 22,400 plates, but the agency is awaiting the arrival of a new plate-making machine capable of producing 12,000 plates per day.